A trip to some Mayan ruins. 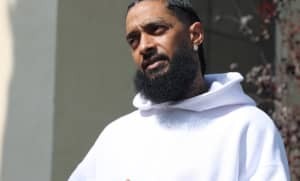 Nipsey Hussle caps off his incredible year in music by sharing the music video to his outstanding Victory Lap title track. Watch it now up above. The clip sees Nip travel down to the location of some ruins from the historic Mayan civilization. The Crenshaw-bred rapper climbs an ancient Mayan pyramid, cruises the sea on a boat, and posts up on a stoop with the homies. Over the past few months, Hussle has released a number of visuals from the album, including vidoes for "Double Up," and "Rap Niggas". Nip's Victory Lap is up for the best rap album award at the 2019 Grammys alongside Travis Scott's Astroworld, Cardi B's Invasion of Privacy, Mac Miller's Swimming, and Pusha T's Daytona.